4,192 K-12 students from across Washington participated in the Washington State Algebra Challenge during the first week of June, using an adaptive version of the game DragonBox. Together, Washington’s students solved over 390,000 equations in a 5 day period! The total amount of algebra work time during the week was 7 months 11 days and 13 hours! 10 home school or home school organization. Algebra Challenge participants solved an average of 93.21 equations (regardless of achieving Mastery), with four students solving more than 1000 equations each. 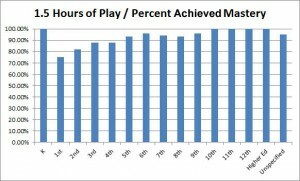 Of those students who played at least 1.5 hours, 92.9% achieved Mastery. 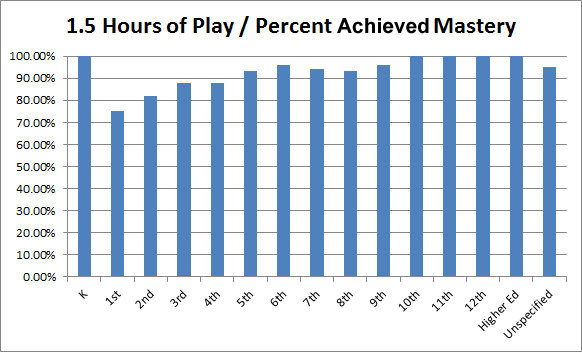 Of those students who played at least 1 hour, 83.8% achieved Mastery. Of those who played at least 45 minutes, 73.4% achieved Mastery. This analysis shows the effectiveness of adaptation – adapting the game to the individual student’s performance – on the overall mastery rate. Almost everyone required some form of adaptation/remediation (as measured by extra levels from the basic progression), while some 7th graders in extreme cases needed up to 5 times more levels than the basic 60 level progression. Kindergardeners needed almost 10 times more levels, but as we know from our other studies, young kids are extremely persistent. 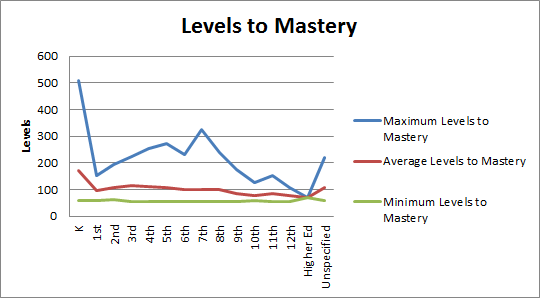 Of those students who achieved Mastery, it took students on average 101.87 levels to achieve Mastery in the game. 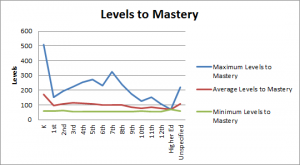 While it took some students fewer levels to achieve Mastery, it took one persistent student 507 levels before achieving Mastery, which highlights the game’s ability to adapt to each student’s learning needs and support each student to achieve Mastery. For specific grade level averages and range (minimums and maximums) see chart below. 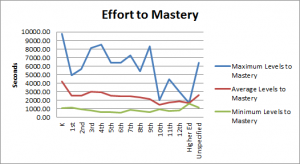 Of those students who acheived Mastery, it took students on average 41 minutes 44 seconds to achieve Mastery. However it is important to note that it took some students less time, while it took one very persistent student 2 hours 43 minutes and 10 seconds to achieve Mastery.